Participation in organized sports for both male and female young athletes is on the rise in the US and across the globe and, not surprisingly, so are sport-related injuries. While youth sport injuries range from mild to severe, one serious and rapidly increasing injury is a tear (or rupture) of the anterior cruciate ligament (ACL). A torn ACL can take a young player off the field for an entire season, and often marks the end of a young athlete’s participation in sports altogether. While many parents fear contact sports are most likely to cause their child to become injured, ACL tears do not usually involve contact or collision. The ACL is a strong ligament that keeps the shin from sliding forward when force from the strong quadriceps muscles are applied to the patella. When the forces of muscular contraction are subjected to opposing forces, the ACL takes the brunt, and a rupture occurs. ACL injury often occurs during quick change of direction, deceleration, twisting and landing from a jump, all motions that occur in soccer and other field sports, basketball and volleyball, in non-organized sports like skateboarding, and on the playground. Help your child get in shape before enrolling in sports. A child who has been sedentary all summer is at greater risk for injury when returning to sports in the fall. 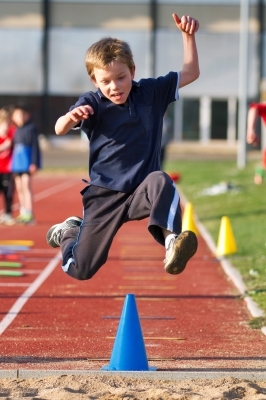 Regularly practice agility drills that involve balance, jumping, agility and power, the same types of movements they will encounter on the playing field, to improve neuromuscular conditioning. Perform other exercises like squats, leg extensions, side lunges and hip extensions that build up the muscles that support the knee. Do not allow your child to skip warmups, and make sure they are well hydrated during practice and play. Insist on your child using equipment properly, and wearing appropriate safety gear. Fitness professionals who want to help children need to understand the basics about youth nutrition and physical activity, and the liability of working with children. W.I.T.S. has everything you need to get started. Begin with a certification like Personal Fitness Trainer, Youth Fitness Specialist and Lifestyle Fitness Coach. Continue your education with Nutritional Concepts, Youth Fitness Foundations, Fundamentals of Sport and Exercise Nutrition, Exercise Program Design for Special Populations, and much, much more!